The value of David Kolb’s experiential learning cycle is that it helps us look at situations from a growth mindset point of view. After something has happened and we’ve reacted, stage 3 asks us to look at what we learnt. Importantly “what we’ve learnt” must be taken from a positive perspective, rather than one that blames ourselves and/or others. I find it useful to ask myself about my omissions/comissions. What did I do that was helpful? What did I do that was unhelpful? What didn’t I do that … that if I had done it, would have been helpful? 1. What did I do that was helpful? Walked away before things got too heated. 2. What did I do that was unhelpful? Didn’t take the time to listen to their point of view. Launched straight into my view. Took a telling rather than an enquiry approach. Grabbed them in the corridor as they were walking past since I wasn’t thinking this was more than a five minute conversation. 3. What didn’t I do that… that if I had done it, would have been helpful? Didn’t take two minutes prior to the conversation to consider whether there were any alternative viewpoints other than the one I was taking. Didn’t check in with them to see if this was a good time. The reason we focus at OUR actions is that the only person whose behaviour we can control is ours. Yes, the other party has a role to play, and holds some responsibility for the outcome, however this is about us growing and improving … and building a better future. Stage 4 builds on stage 3. Having had the “pain” and learnt from it, we can look to see what we can do differently (gain) in the future. This puts us on a continuous improvement curve. If we don’t adopt a learning approach, then we are doomed to repeat the same mistakes over and over (often with increasing personal pain). There is another huge benefit to adopting a growth approach – it directs our attention from the past (which we cannot change) to the present and the future. 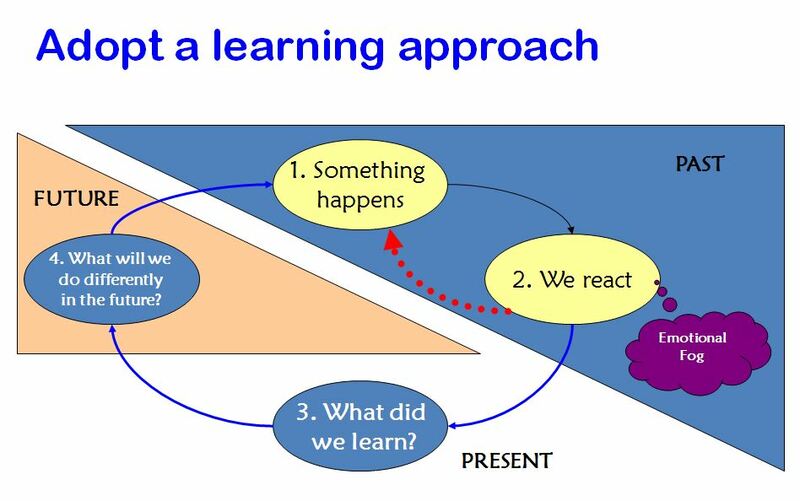 Asking ourselves about what we learnt, brings our attention to the ‘here and now’. This is important because it gives us a sense of control. Asking ourselves then what we intend to do differently in the future gives us a way forward which doesn’t just repeat past patterns. There is no guarantee that we will remember (or have the emotional control) to take this alternative path when a similar situation occurs in the future, however we are certainly better off than if we haven’t done any thinking about it at all. Eventually we will manage to do things differently. An experience which confirmed for me the importance of adopting a learning approach came from my years of doing crisis telephone counselling at Lifeline. What stood out was the high percentage of phone calls that were focused on negative events in the past, and how resistant callers were to bringing their attention to the present moment and looking at what actions they might take to improve their circumstances. Many were heavily mired in blame. It’s easy to blame ourselves or others. It’s also incredibly unhelpful! Blaming others leaves the power to change the situation in their court. Blaming ourselves without looking at how we might change for the better simply leaves us in pain. If we view every circumstance as a “learn from experience”, then by definition our future improves as we get better at what we do. If we adhere to the fixed mindset, then there is a tendency to assume that “we are like we are” and “they are like they are” and that there isn’t much, if anything, we can do about it. This conclusion means that we don’t seek to modify future interactions. We seek to endure rather than improve. Think about a recent work situation that didn’t go the way you would have liked it to. How did you view it? As a mistake or as a learning experience? How were you left feeling? Angry? Frustrated? Helpless? Determined to do differently in future? Given your conclusions about the situation, are you more or less inclined to connect up with that person in the future? Are you satisfied with your response? Is it maintaining the status quo or opening up the possibility of change? It’s not always easy to view everything from a growth perspective. Particularly after or during difficult circumstances, however adhering to a fixed mindset almost guarantees unhappiness.